Each federal electoral district returns one Member of Parliament (MP) to the House of Commons of Canada; each provincial or territorial electoral district returns one representative—called, depending on the province or territory, Member of the Legislative Assembly (MLA), Member of the National Assembly (MNA), Member of Provincial Parliament (MPP) or Member of the House of Assembly (MHA)—to the provincial or territorial legislature. While electoral districts at both the federal and provincial levels are now exclusively single-member districts, multiple-member districts have been used in the past. Alberta has had a few districts that returned from two to seven members: see Calgary, Edmonton and Medicine Hat. British Columbia had a mix of multiple-member districts and single-member districts at the provincial level until the 1991 election, and Prince Edward Island had dual-member districts at the provincial level until the 1996 election. Since 2015 there have been 338 federal electoral districts in Canada. In provincial and territorial legislatures, the provinces and territories each set their own number of electoral districts independently of their federal representation; although the province of Ontario currently defines most, but not all, of its provincial electoral districts to align with federal boundaries, no other province does so, and even Ontario maintains a few variances from federal boundaries. Elections Canada is the independent body set up by Parliament to oversee Canadian federal elections, while each province and territory has its own separate elections agency to oversee the provincial and territorial elections. Originally, most electoral districts were equivalent to the counties used for local government, hence the French unofficial term comté. However, it became common, especially in Ontario, to divide counties with sufficient population into multiple electoral divisions. The Constitution Act, 1867, which created the electoral map for Ontario for the first general election, used the term "ridings" to describe districts which were sub-divisions of counties. The word "riding", from Old English *þriðing "one-third" (compare farthing, literally "one-fourth"), is an English term denoting a sub-division of a county. In some of Canada's earliest censuses, in fact, some citizens in the Ontario ridings of Bothwell, Cardwell, Monck and Niagara listed their electoral district as their "county" of residence instead of their actual county. Although the term "riding" is no longer used officially to indicate an electoral district, it has passed into common usage. Soon after Confederation, the urban population grew—and more importantly, most city dwellers gained the franchise after property ownership was no longer required to gain the vote. Rural constituencies therefore became geographically larger through the 20th century and generally encompassed one or more counties each, and the word "riding" became used to refer to any electoral division. A political party's local organization is generally known as a riding association; the legal term is electoral district association or EDA. Electoral district names are usually geographic in nature, and chosen to represent the community or region within the electoral district boundaries. Some electoral districts in Quebec are named for historical figures rather than geography, e.g., Louis-Hébert, Honoré-Mercier. Similarly in Alberta provincial districts mix geographic names with those of historical personages (e.g., Edmonton-Decore after Laurence Decore, Calgary-Lougheed after Peter Lougheed and James Alexander Lougheed). This practice is no longer employed in the other provinces and territories. Electoral district boundaries are adjusted to reflect population changes after each decennial census. Depending on the significance of a boundary change, an electoral district's name may change as well. Any adjustment of electoral district boundaries is official as of the date the changes are legislated, but is not put into actual effect until the first subsequent election. Thus, an electoral district may officially cease to exist, but will continue to be represented status quo in the House of Commons until the next election is called. This, for example, gives new riding associations time to organize, and prevents the confusion that would result from changing elected MPs' electoral district assignments in the middle of a Parliament. On some occasions (e.g., Timiskaming—French River, Toronto—Danforth), a riding's name may be changed without a boundary adjustment. This usually happens when it is determined at a later date that the existing name is not sufficiently representative of the district's geographic boundaries. This is the only circumstance in which a sitting MP's riding name may change between elections. The present formula for adjusting electoral boundaries was adopted in 1985. It starts with the number of seats in Parliament at that time, 282. One seat is automatically allocated to each of Canada's three territories, leaving 279. The total population of Canada's provinces is thus divided by 279, resulting in an "electoral quotient", and then the population of each individual province is divided by this electoral quotient to determine the number of seats to which the province is officially entitled. Finally, a few special rules are applied. Under the "senatorial clause", a province's number of seats in the House of Commons can never be lower than its constitutionally mandated number of senators, regardless of the province's population. Under the "grandfather clause", the province's number of seats can also never fall below the number of seats it had in the 33rd Canadian parliament. A province may be allocated extra seats over its base entitlement to ensure that these rules are met. In 2004, for example, Prince Edward Island would have been entitled to only a single seat according to the electoral quotient, but through the senatorial clause the province gained three more seats to equal its four senators. Quebec was only entitled to 68 seats by the electoral quotient alone, but through the grandfather clause the province gained seven seats to equal the 75 seats it had in the 33rd Parliament. Saskatchewan and Manitoba also gained seats under the grandfather clause, New Brunswick gained seats under the senatorial clause, and Nova Scotia and Newfoundland and Labrador gained seats under both clauses. A third protection clause exists, under which a province may not lose more than 15 per cent of its seats in a single adjustment, but specific application of this rule has never been needed. In practice, the process results in most provinces maintaining the same number of seats from one redistribution to the next, due to the senatorial and grandfather clauses—prior to the 2015 election, only Ontario, Alberta and British Columbia, traditionally the country's three fastest-growing provinces, had ever gained seats in a redistribution. All other provinces still held the same number of seats that they held in 1985, and were thus already protected from losing even one seat by the other clauses. The 2012 redistribution, which added three new seats in Quebec, was the first time since 1985 that any of the other seven provinces had ever gained new seats. The 15 per cent clause will thus only become relevant if Ontario, Alberta or British Columbia undergoes a rapid population decline, leading to a reduction in their seat entitlement, in the future. Some sources incorrectly state that a special provision guaranteeing a certain number of seats to Quebec is also applied. While such a provision was proposed in the failed Charlottetown Accord, no such rule currently exists—Quebec's seat allotment in the House of Commons is in fact governed by the same adjustment clauses as all other provinces, and not by any provisions unique to Quebec alone. In 2008 the government of Prime Minister Stephen Harper proposed an amendment to the process which would have given Alberta, British Columbia and Ontario, the three provinces whose electoral districts have an average size larger than those in Quebec, a total of 32 additional seats by applying Quebec's average of 105,000. The measure initially included only British Columbia and Alberta; Harper later proposed an alternative plan which included Ontario. However, opposition then emerged in Quebec, where politicians expressed concern about the province losing clout in Ottawa if its proportion of seats in the House of Commons were reduced; finally, three new seats were allotted to Quebec as well. The measure did not pass before the 2011 election was called, but was put forward again after the election. It was passed on December 16, 2011 as the Fair Representation Act (Bill C-20), and resulted in the 2012 redistribution process. When the province's final seat allotment is determined, an independent election boundaries commission in each province reviews the existing boundaries and proposes adjustments. Public input is then sought, which may then lead to changes in the final boundary proposal. For instance, the proposed boundaries may not accurately reflect a community's historical, political or economic relationship with its surrounding region; the community would thus advise the boundary commission that it wished to be included in a different electoral district. For example, in the 2003 boundary adjustment, the boundary commission in Ontario originally proposed dividing the city of Greater Sudbury into three districts. The urban core would have remained largely unchanged as Sudbury, while communities west of the central city would have been merged with Algoma—Manitoulin to form the new riding of Greater Sudbury—Manitoulin, and those east and north of the central city would have been merged with Timiskaming to create the riding of Timiskaming—Greater Sudbury. Due to the region's economic and transportation patterns, however, "Timiskaming—Greater Sudbury" was particularly opposed by its potential residents — voters in Sudbury were concerned about the weakening of their representation if the city were divided into one city-based riding and two large rural ones rather than two city-based ridings, while the Timiskaming District is much more strongly aligned with and connected to North Bay, to which it has a direct highway link, than to Sudbury. In a deputation to the boundary commission, Sudbury's deputy mayor Ron Dupuis stated that "An electoral district must be more than a mere conglomeration of arbitrary and random groups of individuals. Districts should, as much as possible, be cohesive units with common interests related to representation. This makes a representative's job of articulating the interests of his or her constituency much easier." Instead, in the final report that was passed by the House of Commons, the Sudbury area's existing ridings of Sudbury and Nickel Belt were retained with only minor boundary adjustments, while the Timiskaming riding was merged with Nipissing. Despite the opposition that arose to the 2003 process, however, virtually the same tripartite division of the city was proposed in the boundary adjustment of 2012, although due to concerns around balancing the Northern Ontario region's population against its geographic size, the commission announced in 2013 that it would retain the existing electoral districts again. Similarly, opposition arose in Toronto during the 2012 redistribution process, especially to a proposal which would have divided the Church and Wellesley neighbourhood, the city's primary gay village, between the existing riding of Toronto Centre and a new riding of Mount Pleasant along the length of Wellesley Street. In the final report, the northern boundary of Toronto Centre was shifted north to Charles Street. Once the final report is produced, it is then submitted to Parliament for approval, which is given by voting on the report as a piece of legislation known as a Representation Order. From Canadian Confederation, the boundaries were defined by the Constitution Act, 1867. Boundaries for one or more electoral districts were updated in 1872, 1882, 1892, 1903, 1914, 1924, 1933, and 1947. Subsequent changes are known as Representation Order, and occurred in 1952, 1966, 1976, 1987, 1996 and 2003. Such changes come into force "on the first dissolution of Parliament that occurs at least one year after its proclamation". For example, the 2003 Representation Order was deemed to be effective 1 January 2004, and came into force after dissolution of the 37th Canadian Parliament on 23 May 2004. The boundary adjustment processes for electoral districts in provincial or territorial legislative assemblies follow provincial or territorial, rather than federal, law; they are overseen by each province's or territory's own election agency rather than by Elections Canada, and legislated by the provincial legislature rather than the federal parliament. Each province is free to decide its own number of legislative assembly seats, and is not required to comply with the federal quotas that govern its number of parliamentary districts. Prior to 1999, provincial electoral districts were defined independently of federal districts; at the time of the 1999 Ontario general election, the province had 103 seats in the Canadian House of Commons but 130 in its provincial legislature. For that year's election, however, the government of Mike Harris passed legislation which mandated that seats in the provincial legislature would follow federal electoral district boundaries, both reducing the size of the legislature and eliminating the cost of the province conducting its own boundary adjustment process. After each federal boundary adjustment, seats in the legislative assembly would henceforth be automatically realigned to match the federal boundaries at the first subsequent provincial election. 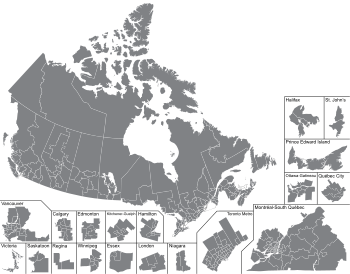 Although most electoral districts in the province still conform to federal boundaries, later amendments to the 1999 legislation have reauthorized the introduction of some differences from the federal map. In the Southern Ontario region, provincial districts remain in precise alignment with the federal ones; in the Northern Ontario region, however, because the region's slower growth would result in the gradual loss of seats compared to the more rapidly growing south, most districts still retain the same boundaries as the federal districts that were in place as of 2003, and are not readjusted to correspond to current federal boundaries. For the 2018 Ontario general election, further, two new uniquely provincial districts were added to improve representation for the far north of the province. As a result, the province currently has 121 seats in the House of Commons, but 124 seats in the provincial legislature. When Prince Edward Island joined Confederation in 1873, it set a fixed formula in which each of the province's three counties was divided into five electoral districts per county, each of which elected two representatives to the provincial legislature. These districts were never adjusted for demographic changes, except in 1966 when the district for the capital city of Charlottetown was divided into two. After 1966, however, the electoral district boundaries again remained unchanged until 1996, when the province adopted new single-member districts. Under the new model, electoral districts are now adjusted every ten years, although most adjustments are geographically modest and the district's name is sometimes, but not always, the only substantive change that actually occurs. Because electoral district boundaries are proposed by an arms-length body, rather than directly by political parties themselves, gerrymandering is not generally seen as an issue in Canada. However, in 2006 the provincial government of Prince Edward Island was accused of gerrymandering after it rejected the independent boundary commission's report and instead proposed a new map that would have seen the cities of Charlottetown and Summerside each gain one additional seat, with two fewer seats allocated to rural areas of the province. The alternate map gave every incumbent member of the governing party a "safe" seat to run in, while the original report would have forced some of the party's MLAs to compete against each other in nomination contests. In Alberta too gerrymandering was an issue, when the provincial Conservative government ignored the report of the independent boundary commission in 1991/2. The changes it did bring in were instrumental in losing two NDP seats (Ewasiuk's and Martin's). As well, the Social Credit government's move away from multi-member constituencies (and the STV) in 1957 was an attempt (successful for a decade) to retain power. The unequal size of electoral districts across Canada has sometimes given rise to discussion of whether all Canadians enjoy equal democratic representation by population. For example, the four federal electoral districts in Prince Edward Island have an average size of just 33,963 voters each, while federal electoral districts in Ontario, Alberta and British Columbia have an average size of over 125,000 voters each—only slightly smaller, in fact, than the entire population of Prince Edward Island . Conversely, pure representation by population creates distinct disadvantages for some Canadians, giving rise to frequent debate about how to balance the population size of electoral districts against their geographic size. Whereas urban districts, such as Toronto Centre, Vancouver Quadra or Notre-Dame-de-Grâce—Lachine, may be as small as 50 km2 or less, more rural districts, such as Timmins—James Bay, Abitibi—Baie-James—Nunavik—Eeyou or Desnethé—Missinippi—Churchill River may encompass tens or hundreds of thousands of square kilometres in size. Thus, while Canadians who reside in major urban centres typically live within walking distance of their federal or provincial representatives' constituency offices, a rural resident may not even be able to call their federal or provincial representative's constituency offices without incurring long-distance calling charges. Further, a rural politician who represents dozens of geographically dispersed small towns must normally incur much greater travel expenses, being forced to drive for several hours, or even to travel by air, in order to visit parts of their own district—and may even need to maintain more than one constituency office in order to properly represent all of their constituents. In Ontario, for example, the highest annual expense budgets among members of the Legislative Assembly of Ontario are consistently filed by the representatives for Mushkegowuk—James Bay and Kiiwetinoong, the province's two largest and northernmost electoral districts; both must spend far more on travel to and from Toronto, travel within their own ridings and additional support staff in multiple communities within their ridings than any other legislator in the province. ^ Constitution Act, 1867, First Schedule. ^ "Search". The Globe and Mail. ^ a b c d Department of Justice (Canada) (2009-11-02). "Constitution Acts, 1867 to 1982". Archived from the original on 2012-03-29. Retrieved 2009-11-09. ^ "Ontario to gain seats in Parliament", The Globe and Mail, December 17, 2008. ^ a b "Riding size inequalities rob us of our democratic voice". Edmonton Journal, March 25, 2011. ^ "Conservatives seek ‘fairness’ in reallocating Commons seats". The Globe and Mail, June 2, 2011. ^ Thandi Fletcher (December 16, 2011). "Crowded House: Parliament gets cozier as 30 seats added". Canada.com. Postmedia News. Archived from the original on March 14, 2013. Retrieved December 19, 2011. ^ Proposed Electoral Boundaries Readjustment Act, 2003. Federal Electoral Boundaries Commission for Ontario. ^ a b "City Urges Commission to Maintain Existing Federal Electoral Boundaries". City of Greater Sudbury, October 29, 2002. ^ "Electoral boundary changes could affect northern Ontario". CBC News, August 28, 2012. ^ "Northern ridings to stay at 10, electoral commission says". CBC News, February 27, 2013. ^ a b "Federal electoral district (FED)". Census Dictionary. Statistics Canada. Retrieved 2012-03-02. ^ "An Act respecting the effective date of the representation order of 2003 (S.C. 2004, c. 1)". Department of Justice (Canada). Retrieved 2012-03-02. ^ "No Christmas election: Binns". cbc.ca, November 16, 2006. ^ "Electoral map a distraction: Constable". cbc.ca, June 15, 2006. ^ Mowat Centre. "Mowat Centre for Policy Innovation". Archived from the original on 6 July 2011. Retrieved 23 March 2010. ^ "Queen's Park's biggest spenders revealed". Toronto Sun, June 1, 2011.